WINGATE – Sweet 16 and loving it! 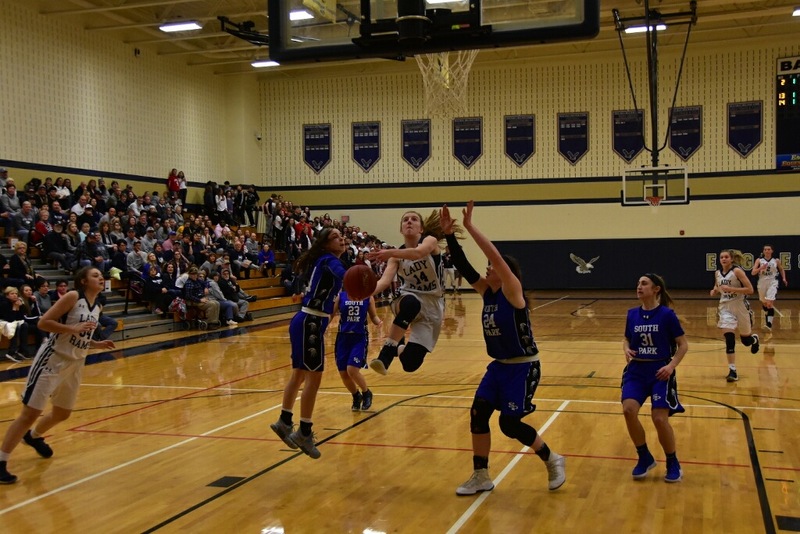 For the second year in a row, the Penns Valley Lady Rams are headed back to the PIAA Sweet 16 after defeating South Park Friday night at the Bald Eagle Area Gymnasium, 49-42. It was a night where the Rams’ defense would keep the Eagles at bay for most of the contest. However, a late run by South Park in the final stanza made the Lady Rams dig deep and come up big at the foul line late. Hannah Montminy hit 7-of-8 in the fourth while her teammates combined for 6-of-11 to seal the deal in the final seconds to secure the victory. Montminy finished with 21 points on the night and pulled down four rebounds. Bella Culver came up strong defensively, keeping the Eagles inside game, aka Maura Huwalt at bay for much of the game. She finished with only 10 points while Culver tallied 21 with nine rebounds. Teammate Jordan Andrus cleaned up on the boards as she collected 16 hard fought rebounds and had two free throws in the final quarter. The Lady Rams’ defense came roaring out and took a strangle hold on South Park. Leading going into the final stanza, Penns Valley upped its lead to 32-19 when Culver hit a shot in traffic to extend the lead to a 13-point deficit for the Eagles. But Huwalt would heat up and hit her second field goal of the game with 7:00 minutes left. The Rams and Culver battled back and scored consecutive points as she was fearless going in the lane for the difficult contested shot attempts. Her four points put her team up 36-21 which forced a South Park time out. The pep talk helped the Eagles as they scored four points on consecutive trips down court. With 5 minutes left, South Park pulled to within 11. Kennedy Welshans hit 1-of-2 to up the lead to 12. After a media time out, Kubalak was fouled and made both shots from the charity stripe to extend the Rams’ lead. At the 2:41 mark, Penns Valley was called for an intentional foul, allowing Cassidy Zandier to hit 2-of-2 to make it a 39-27 game. After getting the rebound after Montminy hit 1-of-2 from the foul line, South Park got the ball to the corner and dished it to Danielle DeProspo who then launched a long three, making it a 40-30 game. South Park wasn’t done as they forced another turnover and the Eagles got the ball to Zandier, inching closer at 40-32. However, after escaping the South Park full court pressure, the Lady Eagles got the ball back in the hands of Montminy and she was cool under pressure, hitting both foul shots. With a minute left, Huwalt single handedly cut the score to 42-37 as she hit a forceful shot inside and got the ball as the Eagles forced a turnover and Huwalt stepped behind the three-point line and hit nothing but net, closing it to 42-37 with 48.9 left. That would be as close as South Park would get the Rams made the most of their trips to the line to outlast the Eagles, 49-42. Penns Valley used that momentum from it defense and carried it over offensively, opening the game with a 9-0 run to start the game. Montminy and Culver would lead the Rams to an 11-3 first quarter lead as they finished with a 5-point and a 4-point performance, respectively. Paige Kubalak chipped in with a field goal. Again, the second period once again was highlighted by the stifling defensive prowess of the Lady Rams. Penns Valley once again held the visiting Eagles to single digits while its offense produced another 11 points en route to the 22-8 halftime lead. This time Montminy had five and Culver had six. But South Park didn’t get to the state playoffs by accident and they started to make its comeback attempt early in the third. This time it would be the Eagles that would outscore the Rams by a mark of 11-8. That would set up the drama that would take place in the final period. However, after being a veteran of numerous nail biters, the Lady Rams were able to shrug off the late fourth quarter surge to enter the next round and a chance to take the team to historic heights.